As time passes, bodies change. Hair colors change. Skin textures change. Voices change. And, inevitably vision changes. However, changes in your vision don't have to mean a change in your lifestyle. A program of preventive eye examinations and prompt treatment of problems can keep your eyes at their best throughout your life. If you're near the age of 40, you may have already experienced problems with reading anything closer than arm's length. If so, you probably are developing presbyopia. Presbyopia, caused by a rigidity of the crystalline lens, robs the lens of its ability to properly focus light passing through the eye. Presbyopia is usually noticeable around age 40 and becomes more pronounced with time. You may need glasses only for reading, sewing, or doing close work unless other vision conditions also affect your eyes. Many vision conditions, including presbyopia, can also be corrected with contact lenses. Laser vision correction itself does not correct for presbyopia. We will recommend what is right for your vision condition. Click here for more details about Presbyopia. Cataracts are the leading cause of reversible blindness in the United States. 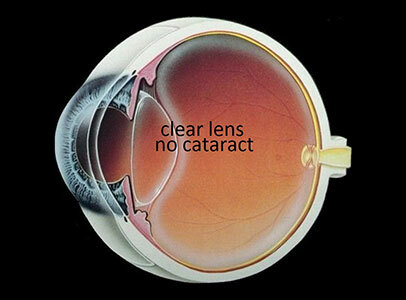 Cataracts cloud the normally clear transparent lens of the eyes, thus blurring vision. 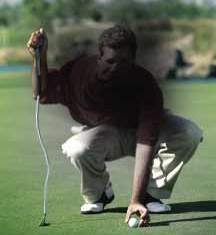 Like presbyopia, cataracts commonly occur with aging. Everyone eventually has cataracts. It is from years of exposure to the ultraviolet rays of the sun. If you leave a newspaper outside for several days, it turns brown/yellow. The same thing happens to the lens inside your eye. They are surgically removed in a 15-minute procedure when proper vision correction cannot be obtained with glasses or contact lenses. 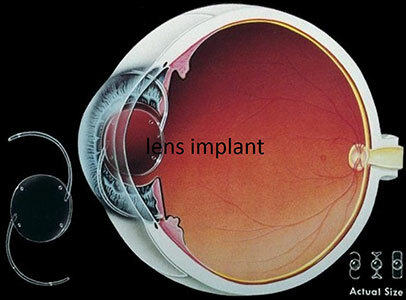 An artificial lens can be implanted to restore clear vision without the necessity of thick glasses. Sometimes glasses are needed only for reading the small print. With a skilled surgeon, cataract surgery is relatively uncomplicated and has a very high success rate. 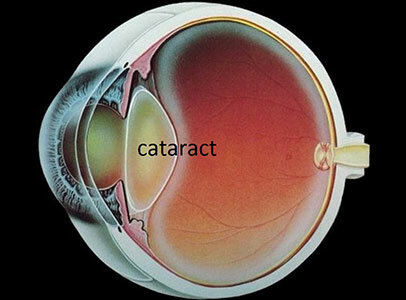 Click here for more details about cataracts. One out every 50 people over the age of 35 suffer form glaucoma, making it one of the leading causes of blindness in the United States. Glaucoma is classically caused by a progressive increase of pressure within the eye, which causes irreversible damage to the optic nerve. The increased pressure restricts the flow of nutrients to the optic nerve. A similar scenario would be if a tight tourniquet was applied to the wrist, the hand would eventually suffer damage from lack of blood flow. However, there are forms of glaucoma where the pressure inside the eye is normal. Your chances of developing glaucoma are even higher if you are African American; suffer from diabetes, anemia, or hardening of the arteries, migraines, sleep apnea; or have a family history of glaucoma. Most glaucoma can be treated with eye drops. Because most types of glaucoma develop gradually and painlessly, damage can be extended before it is noticeable to the patient. Glaucoma can be treated, but nothing can repair nerve damage once it occurs. That is why annual, preventive eye examinations are essential after age 40. Glaucoma is detected by a variety of tests. We have invested in diagnostic instrumentation found in the leading hospitals and glaucoma clinics: Several forms of Tonometry, which measures you're the pressure inside your eye. 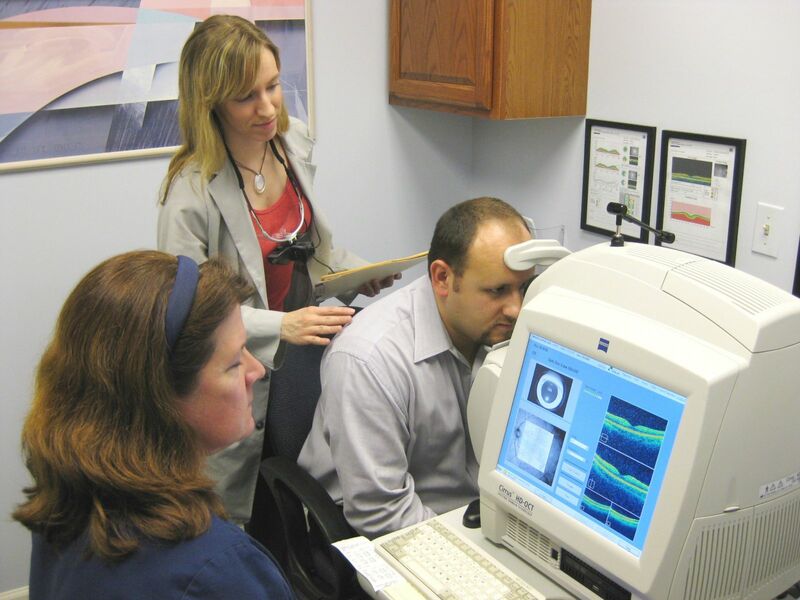 Zeiss Humphrey full threshold visual fields, which measures vision loss; Zeiss Cirrus 5000 OCT, which measures beneath the eye and can detect glaucoma up to 5 years earlier than was previously possible. Optos wide field imaging, that takes a 200-degree picture of the back of the eye without the need to dilate. 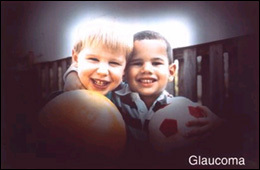 Click here for more details about glaucoma. Dr. Streiff overseeing an OCT.
Another condition which may affect the aging eye is macular degeneration. This occurs when the central point of focus on the retina (called the macula) is damaged. One reason macular degeneration often goes unnoticed is that it usually affects only one eye. In this case, the good eye compensates for the affected eye, allowing the problem to go unnoticed by the patient. This is one reason annual eye examinations are recommended after age 40. Treatment of macular degeneration may include the use special eye vitamins, medicine placed within the eye, laser surgery, and magnification devices. Click here for more details about macular degeneration. There are hundreds of tiny glands in the eyelids that produce the tears. With dry eye, these glands don't produce the proper quality or quantity of tears causing the eyes to sting, burn, feel scratchy or gritty and TEAR. Yes, having dry eye can cause your eyes to tear or water. It can also be the cause of stringy mucus and red eyes which are made worse by irritation from smoke or other irritants (wind, low humidity). While dry eyes is more prevalent as we age, it may also be caused by many prescription and nonprescription medications including antihistamines, beta-blockers, decongestants, diuretics, oral contraceptives, sleeping medications, tranquilizers, and tricyclic antidepressants. Check with us or a pharmacist if you suspect that a medication is causing dry eyes. Dry eyes may not sound like a serious problem. However, if inadequately treated, can be debilitating and chronic dryness can lead to corneal damage and scars. Dry eye can be associated with autoimmune diseases such as Lupus and Sjorgrens. house or in the bedroom is a good start. Ordinary tear-replacement drops can control mild problems. use of short-term steroids and Restasis or Xiidra. tears that you produce from draining. Click here for more details about dry eye. Of course, there are many other conditions that occur as we age. These are the most common.